This article contains spoilers for the Flash season finale – Finish Line. I had some ideas of what we might see in the season finale of The Flash. One of them was right… the rest were way wrong. I, like many people, came out of last week almost certain that H.R. (Tom Cavanagh) was going to swap places with Iris West (Candice Patton). Part of the reason was they took the time to show us that his appearance device could work on opposite genders when Barry Allen (Grant Gustin) posed as Lyla Michaels (Audrey Marie Anderson) last week. That is exactly what happened as H.R. tries to make up for his mistake of letting Savitar know where Iris was. This was extra sad in that he had just started a relationship with Tracy Brand (Anne Dudek). But from that point forward, the show took a lot of twists. H.R. sacrifice changes the future and makes Savitar a time anomaly, which should correct itself over time. But Savitar doesn’t want to disappear, so he grabs the Speed Force Bazooka and Cisco Ramon (Carlos Valdes) with a plan to splinter himself across all time. I have absolutely no idea how that would work or even why that would be a good idea… but hey, we’re watching a show about people that run at super speeds and can cause vibrations, I can accept a bit of pseudo-science. He gets Cisco to agree to help by promising to let Caitlin Snow / Killer Frost (Danielle Panabaker) go in the end. We also learn that Julian Albert (Tom Felton) has come up with a cure for Killer Frost. 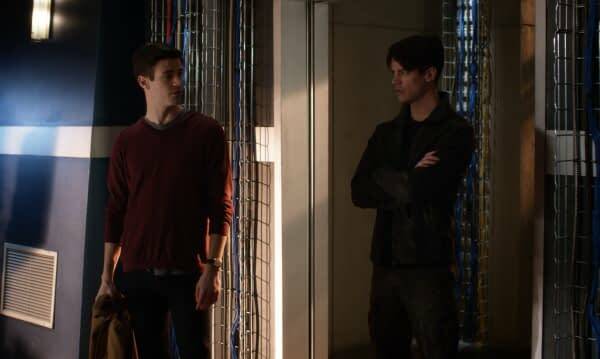 Barry decides his next move shouldn’t be filled with hate and he goes to talk with Savitar. He tries to reason with him and promise they’d help save him. Savitar plays along for a while and we get to see who the team reacts to him. We get to see what Barry is supposed to be, a hero filled with hope and a desire to save not kill. This whole season has been Barry going down a very dark path but as we get to the end of the season, we get the Flash of the comics. The one that will try to save everyone no matter what it would cost him personally. Of course Savitar is faking his interest and sets off a Speed Force explosion of some kind that was meant to take out Team Flash… but Barry and Wally West (Keiynan Lonsdale) gets everyone out okay. Then in one of the surprises of the episode, Gypsy (Jessica Camacho) rescues Cisco and takes him to Barry’s apartment. Savitar goes to use the modified bazooka and has Killer Frost deal with the Black Flash… who used to be Hunter Zolomon (Teddy Sears) from season 2. We learn that Cisco lied and the bazooka actually let Jay Garrick (John Wesley Shipp) out of the Speed Force prison. We then have Vibe and Gypsy vs Killer Frost while Flash, Kid Flash and Jay Garrick take on Savitar in a battle royale that ends with Barry vibrating into the Savitar suit and expelling evil Barry. He then stops himself from killing Evil Barry and destroys the Savitar suit. But Evil Barry isn’t done and is about to kill Barry when Iris shoots him in the back. Then evil Barry vanishes into time. Oh… and I almost forgot, Killer Frost saved Vibe from Savitar… making it questionable which persona she is anymore. The episode looks like it’s going to end on a happy note, Iris is going to live, her and Barry can get married… I mean happy except that H.R. is dead, but they have another Harrison Wells still. Then the Speed Force freaks out because no one is in the prison created to hold Savitar… which makes me wonder why there is a prison if Savitar never existed… anyway, the only way to save the city is for Barry to go into the Speed Force. He gets his moment to say goodbye to everyone except Jay… don’t know why he didn’t say anything to Jay who was standing right there. And then he walks off into the Speed Force with an incarnation of his mother. The episode was an emotional roller coaster. Just following Joe West (Jesse L Martin) who went from losing his daughter, to finding out she was alive but a friend was dead, to seeing everyone at risk and finally a happy ending only to lose Barry to the Speed Force. Poor Joe. I think the episode was a good ending to a season that dug into what really makes Barry Allen / The Flash a hero. The fact he has super speed has nothing to do with hit. Barry has the heart of a hero and it beat on hope. Savitar is what happens when that hopes dies, but the Barry we get at the end makes the right choices for the right reasons. He accepts his fate for his actions. This is all fallout from Flashpoint and he knows this is his penance. Wanting to save his mother, where completely understandable, was also selfish and now he has to pay the price. What we know about season four is that the big bad is likely to be The Thinker / Clifford DeVoe, that Earth-2 Harrison Wells is likely to stick around and the odds of Barry not coming out of the Speed Force early in the new season are low. The team will likely need Tracy Brand to find a way to get Barry out. Also, with the new dynamic for Caitlin / Killer Frost, there are lots of stories there as well. Plus, in the comics the Speed Force storm that we got at the end of the episode appeared in the comics once and created a bunch of new speedsters. The TV series might use that to create some new meta villains for season two. Either way, it was a good end to a good season.